Here’s a collection of videos about Power View and Power Pivot in Microsoft Excel 2013. 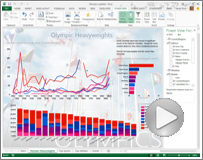 More about creating Power View sheets in Excel 2013. More about bubble and scatter charts. More about filters and highlighting. More about refreshing the data or data model. More about hiding tables, columns, and fields from PivotTables and Power View. More about adding descriptions to Power Pivot tables, columns, and fields. More about relationships in Power View. More about setting default aggregations.